Add a burst of energy to your skin with the Freshly Juiced Vitamin Drop! Designed with naturally effective ingredients that are safe and non-irritating, the Freshly Juiced Vitamin Drop energizes and rejuvenates your skin with the power of pure vitamin C! Don’t stress over dull skin tone and enlarged pores anymore - let the multi-solution Freshly Juiced Vitamin Drop take care of your skin in a simpler, safer way. Klairs Freshly Juiced Vitamin Drop contains 5% ascorbic acid and is suitable for all ages and skin types, even if you have the most sensitive skin. The formula is fragrance-free, non-irritating and has a pH level of 3.81. Disclaimer: Serum may appear colorless to golden yellow. This color change does not affect the efficacy of the product when stored and used as directed. Klairs is respectful of the beauty of the environment and carries healthy values regarding the Earth. A high quality skin care brand, Klair offers a simple lineup that provides everything from cleansing and moisturising, to calming and soothing. Simple but enough, the products contain only the most effective and necessary ingredients. Klair product range is free from colorants, parabens, alcohol, artificial fragrances. The brand is committed to delivering cruelty-free products. Explore the entire range of Serums & Essence available on Nykaa. 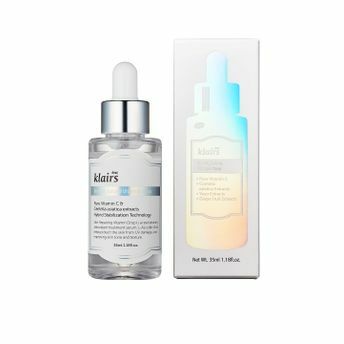 Shop more Klairs products here.You can browse through the complete world of Klairs Serums & Essence .